Nothing inspires me more than wanting to create unique gifts for my loved ones. When you know someone personally, you can focus on their interests, desires, and preferred styles. 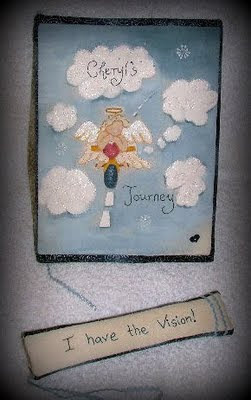 I'd like to give you an example of this thought process with the journal cover I made for my special friend, Cheryl. Cheryl was frustrated that she wasn't making time for her bible studies; she was always busy, she could never find her reading glasses... and she needed peace and quiet in a tranquil location to enjoy her studies to the full. So for her birthday I created a bible studies journal cover depicting her as an angel riding on a motorbike (one of her favourite pastimes is to go 'riding'). I thought the heavenly image of the angel meditating on a bike in the sky would bring her some peace... and hopefully too... a little giggle! I also bought her some reading glasses and made a little pouch for them to go in... with an embroidered quote on the front that I thought might put a cheeky smile on her face! 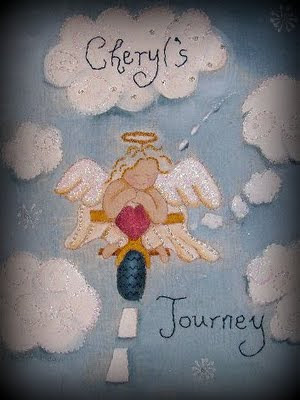 Would you like me to adapt my angel stitchery design as a little freebie to go on the front? Thank you for sharing your creative process. You are right in that it helps to have someone in mind. The Journal and Glasses case are so lovely. BTW did you start your blog with 3 columns or change later? I want to change from 2 to 3 as I'm running out of room, but I am not sure how to do it and if I'll lose everything f I do. What a lovely presents you made!!! How lovely is that! What a thoughtful gift. 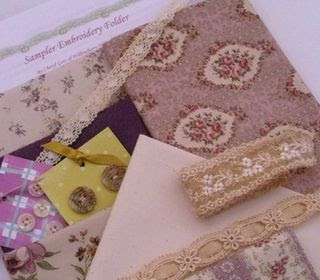 Love the eyeglass pouch too - *G* I'd love to see your tutorial, and the design. You are very talented, and I'm very glad to find your blog! So glad I found you. I like Cal would love to change my blog to 3 columns. But not sure how to do that. This is definitely a great gift idea, especially since my name is Cheryl also! That is a super gift and the angel on the motorbike is just fab. Been a follower of your, I can't be sure it isn't to play with cat, grin, or follow what you are doing, grin. Please enter me in your drawing, and yes I have long followed most of the 'nutters' and have signed in to be a follower of 'the gum tree nutters', you gals are terrible. You have been a very busy gal. Do you have time to miss your teacher> lol I'm sure you are! Oh wow, you are soo talented and creative. Those pieces you made for your friends of the journals and carry alls are just fantastic. That is a beautiful journal made even better by the fact that you have shared the thought processes behind it. It is always so satisfying to make things for people you know well. I love reading what you are up to. I love that you put so much thought and effort into your personal gifts Vik. Having been the very lucky recipient of several gifts from you, I know only too well what an amazing sewer you are. I adore you angel on a motorcycle! What a great and special gift. I like your unique gift with personalized to person. Great Job !